To view your filings, please click the 'e-filing’ tab which will direct you to the Doxpop E-Filing page. Next, find and click the "My Electronic Filings" link on the Doxpop E-Filing page. TIP: If your are unable to find the envelope you are looking for, try clicking here to search for your envelope. Click the button next to the document. A box will be presented listing all of the service contacts you served electronically. - This example shows only one listed, but there could be many more service contacts listed in this box. 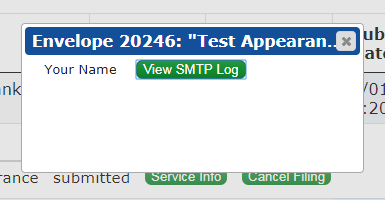 Click the button next to the Service Contact and it will provide you with a detailed log. 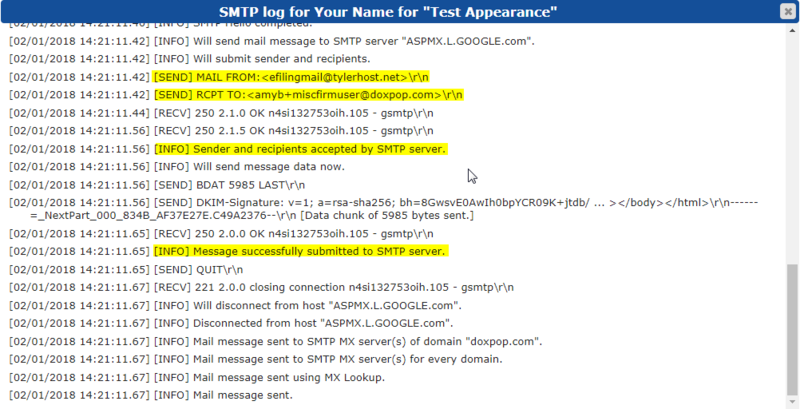 - Although this log contains lots of information that is highly technical and fairly cryptic, it allows you to verify whether the email for service was successfully delivered and to what email address.